If robots could show love this t-shirt shows you how they would do it. 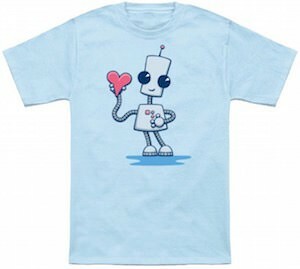 On this t-shirt, you can see a really happy looking robot and it is making a heart with its hands and on the spot where a heart would be in a body. And above the robot it says “You Compute Me” and because you compute the robot you are its first and only love. It’s just a cute and romantic t-shirt that you can wear yourself or give as a present for a geeky loved one. 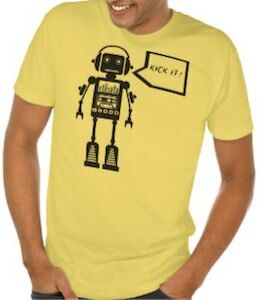 You can get this robot t-shirt in styles for both men and women and it is available in many colors and sizes Small – 6XL. Have your holiday delivered by a robot on this really cute festive t-shirt. It is the Holiday Robot With A Present T-Shirt. Get it right away! This cartoon graphic is so festive and adorable. It is a little grey robot with a rectangle head with large black eyes and a little smile. He has a square body with a couple of red and green buttons with long arms. One arm is holding up a little present wrapped in green paper and wrapped in a red bow. Then his little legs with boots are standing on a little bit of green grass. There are 7 different colors available for this t-shirt. It is made of 100% pre-shrunk cotton, so the unisex fit is comfortable and durable. The sizes range from Small all the way to 6XL. Perfect for all those who like holiday robots. 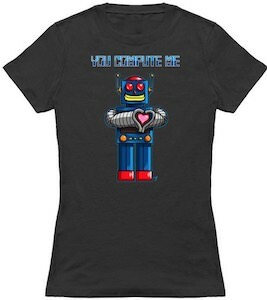 This romantic robot t-shirt is available for the whole family as it comes in men, women’s and kids versions. And on the t-shirt you can see a happy looking robot holding up a heart. Maybe it’s year heart as this robot is so cute that he probably stole it from you. 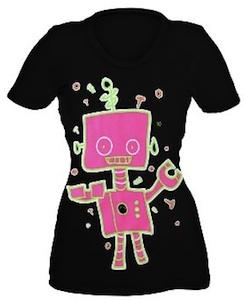 This cute robot t-shirt is available in many colors and that makes it perfect for matching it with you favorite outfit. 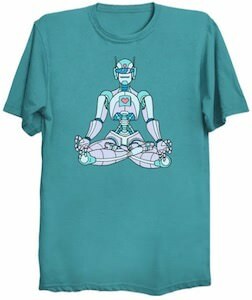 I think a robot should be in everyone’s life and the one on this t-shirt is slowly winning me over. Come take a closer look at this Robot Steals Your Heart T-Shirt. Whether you are into video games or not, this one of a kind t-shirt will spark the interest of anyone that walks by. It will start a conversation at any time of the day, because it will be seen. This Borderlands Costume t-shirt is sure to brighten up even the darkest days because it is the brightest yellow like the sun. On the front is a colorful graphic of the CL4P-TP robot, that actually kind of looks like a blender. But don’t let him fool you, he is an interplanetary ninja assassin. This t-shirt comes in sizes ranging from Medium to 2XL and is a 100% cotton, which means it is durable for everyone who dares to step into this t-shirt. 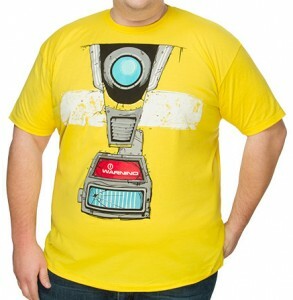 Get in control today with the Borderlands Claptrap Costume T-Shirt. Robots like to jam to and this t-shirt shows one of those robots. The shirt shows a robot wearing headphone and having a equalizer and a tape deck in his chest. And this fun music loving robot has a speech bubble that says “Kick It!”. Do you want a fun t-shirt like this? If you do then you are in luck as you can get this t-shirt is bunch of colors and styles and I am sure they have one in your size to. Robots are cool and maybe a bit geeky and fun. Get ready to dance robot style while wearing this Robot Kick It! T-Shirt. We all know the excuses that the dog eat my homework and maybe you even used it. Now it’s time to modernize this and this funny t-shirt will show the world how. On this t-shirt you can see a robot shredder dog specially made to eat your homework and make it into small shreds of paper. It looks so funny that I wish it came in kids sizes to let kids wear it to school. But lucky for the adults this t-shirt comes in men and women’s sizes and all look funny like this one. 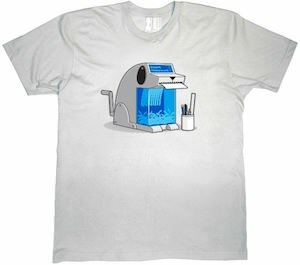 So let all get a K9 Homework Shredder T-Shirt. 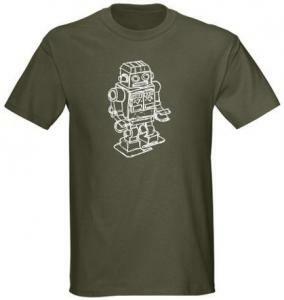 There is nothing better than an old time robot, show off your geekyness with this t-shirt. On the front of this t-shirt find a cool sketch of a retro looking robot, using white line art this is one awsome looking robot making this a classic shirt. A very comfortable and durable 100% cotton t-shirt that can be found in 9 different fun and cool colors aswell as many sizes to choose from. Also check out the many different styles of shirts to get the Retro robot sketch on. You know what the Androids say…An apple a day keeps the apple away! 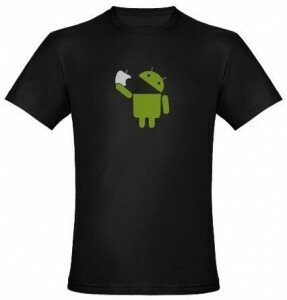 This is a cool t-shirt for all who just cant stand the Apple products, a great image of an Android with a big open mouth just about to devour and Apple. You can find this 100% cotton Apple Vs Android t-shirt in colors black, blue, grey, olive, green, range and asphalt, and in many different sizes and styles. Get your Apple Vs Android T-Shirt today. This robot is not just printed on the front it has a back part to that you have to check out. Cute that is the word of this neon fellow that would love to live with all your other clothes. Go check the front and the back of this Neon Robot T-Shirt.